Increasing attention is being paid to methods for the removal of pharmaceuticals from wastewater. In the TKI programme’s Affinity Adsorption project, KWR, together with partners Sibelco, the Limburg (WL) and De Stichtse Rijnlanden Water Authorities, the Limburg Water Authority company (WBL), and University Medical Center Utrecht, have developed a new adsorbent capable of binding specific pharmaceuticals in wastewater, without being inhibited by the presence of other substances. Pilot research carried out in a hospital and an office building has shown that people are quite prepared, when they use the toilet, to add this adsorbent, named CatchAmed, to the water, and that it is an effective way of binding pharmaceuticals. Adsorption processes are frequently used to remove pollutants from water. Typically this involves the use of activated carbon, which is very good at adsorbing a large number of substances. But the drawback of using activated carbon in wastewater is that the water contains a lot of organic matter that actually doesn’t need to be removed, but is. This is detrimental to the removal efficiency – of pharmaceuticals for example. The new adsorbent, CatchAmed, is made of an inert support material (an aluminium silicate), whose surface has been modified in such a way that it only interacts with specific pharmaceuticals, but not with other organic matter. The newly developed CatchAmed has an excellent capability of removing diclofenac, and other pharmaceuticals of similar molecular structure, from all kinds or water and wastewater. Because of its relatively high density, CatchAmed can subsequently, with its adsorbed pharmaceuticals, be easily removed from the wastewater at the WWTP. Two pilots were conducted: one at the University Medical Center Utrecht and the other at the WL and WBL office in Roermond. People in both instances were asked to put some adsorbent in the toilet before using it. Many were quite prepared to do this: both people in the office building as well as patients and health-care staff at the hospital put the CatchAmed into the toilet, thereby helping cut back on the number of pharmaceuticals that end up in the environment. Moreover, the pilots demonstrated that the adsorbent didn’t only work well in the laboratory, but also in a complex matrix such as that of (hospital) wastewater. Follow-up research is currently underway with the aim of developing adsorbents for other kinds of pharmaceuticals as well. This work will also study the most practical way of adding the adsorbent to the water. 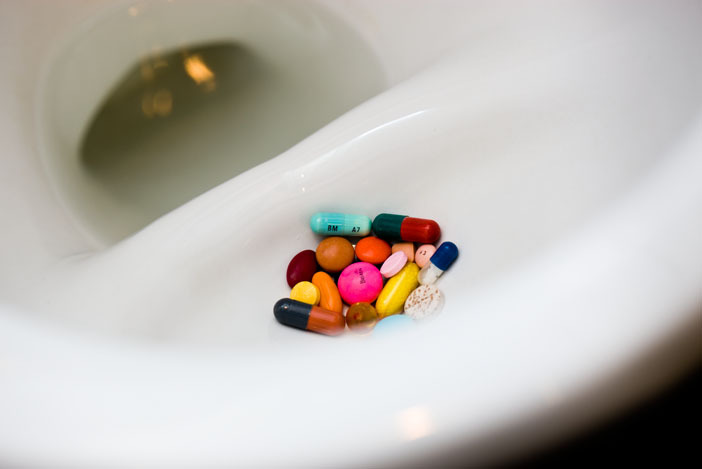 Het bericht CatchAmed binds pharmaceuticals in the toilet verscheen eerst op KWR.